For the one day event Magi Madoka ONLY - Mou Nanimo Kowaku Nai (魔まマ オンリーイベント～もう何も恐くない～), Nao Shirahane (DMYO) of Snow Ring teamed up with Nishimata Aoi from JOKER RING to create a most awesome Madoka doujinshi, Puella Magi Madoka Magica CONNECT. 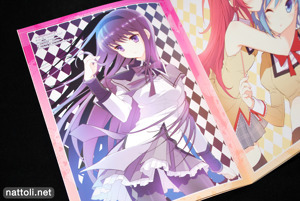 The doujinshi was part of a set that included a bag along with a clearfile that featured a joint illustration by the two artists with Kaname Madoka and Akemi Homura. 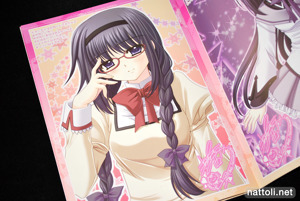 The illustrations used on the bag are both included in the doujinshi as two page spreads, with one on Aoi Nishimata's side and the other on Shirahane Nao's side. 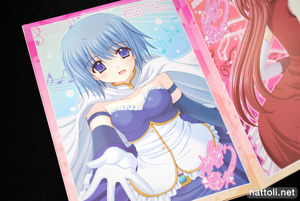 But the clear file illustration is only intact on the file itself, inside the illustration is used as a title page for each artist's side, but you only see half of it faded. 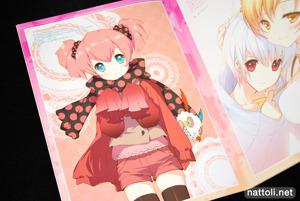 Nishimata Aoi's side had three illustrations that included Kaname Madoka. And aside from the bag illustration, none of her pictures included the girls together, just separately. 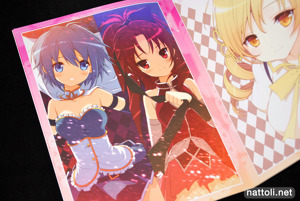 I'm glad both artists did draw each of the main girls though, as it's always interesting to see different styles on the same characters. 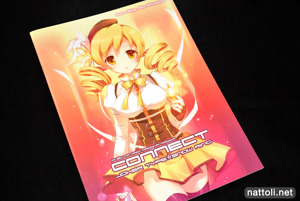 Anyhow, mostly because of the artists involved Puella Magi Madoka Magica CONNECT has been my favorite Madoka illustration doujinshi so far, though I'm still hoping to see even more amazing collections for Comiket 80. 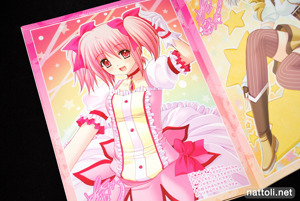 This Madoka doujin looks stunning, will have to try and acquire it. 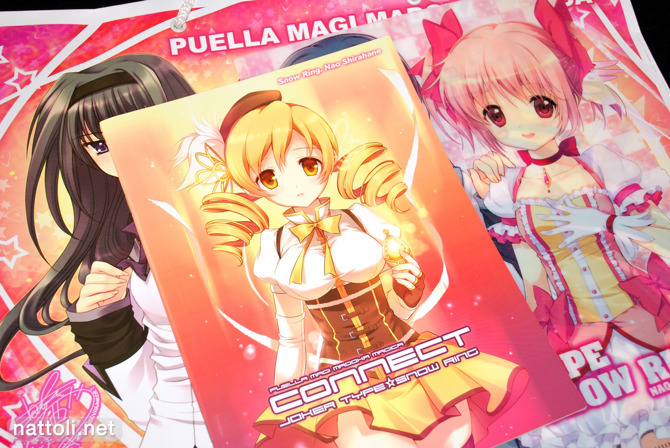 Especially love Dmyo's art of the Madoka girls. Have the Madoka themed "Sweet Cat" doujin by Kamiya Maneki, that's a pretty sweet Madoka book too, though not as thick as this one. I grabbed Kamiya Maneki's book too, they all look quite nice in that style, though DMYO's versions are my hands down favorites... for now anyway! Just depends on what comes out which really varies a lot from month to month, and I've skipped buying anything at all some months!